Choghadiya or Chougdiya is astrological time unit in Jainpanchang, and it is an astrological method to know auspicious time to start new work, so that work can be complete without any problem. Generally choghdiya is good tool to know auspicious time for journey or worship. 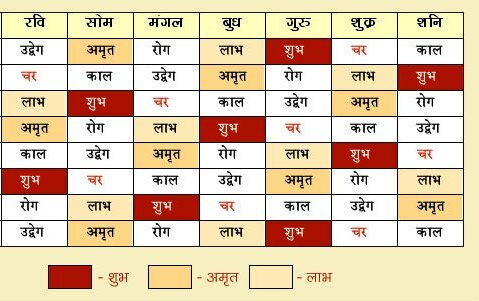 But it can be used for other works also There are two type of tables in any Jainism panchang, Day Choghadiya – the time from Sunrise to Sunset and Night Choghdiya – the time from Sunset to Sunrise. 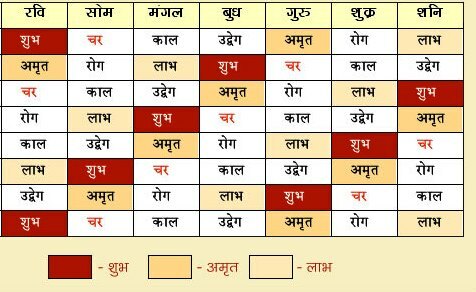 Choghdiya are seven types of, called – Shubh, Labh and Amrit which known as auspicious Muhurat, Chal or Chancal which known as average or normal Muhurat, Udveg, Rog and Kaal which known as inauspicious Muhurat in every Hindu panchang. The inauspicious Choghdiya should be avoided for starting any work. All important works should be commenced during a favourable Choghadiya.